Revised from original 1991 book and includes supplemental index (sold separately in early edition), this 460 page book carries an hardcover ISBN 978-1-936091-32-4. The original large format of 8.5×11″ has been preserved in this full-color hard cover book. Contents include photographs, charts, documents and artwork. Softbound and CD editions also available. Visit the website or contact us for more information. Have you looked online for digital archives of genealogy publications? 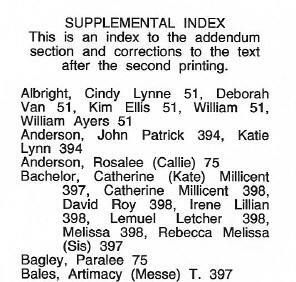 Many organizations place previously unpublished records in their publications and have started allowing online access to back issues and/or indexes! Acronyms should also be considered as candidates for cross reference, such as UDC/United Daughters of the Confederacy. Compound (Smith-Jones), hyphenated (Jim-Bob), and foreign (Los Dio) names should also be cross referenced. If you plan to include nicknames or AKA, decide how you will be formatting them. Do not format them the same as maiden names. We suggest nicknames in quotes “Bob”, and maiden names in parenthesis (Blu).